While we carry the Doosan brand, we can service all makes of material handling equipment. Every technician has experience servicing and maintaining material handling equipment. You can schedule an on-site repair or bring it in to us – whichever suits you best and gets you up and running as soon as possible. Have an emergency? Call our service technicians that are available 24/7 at (704) 842-3242. 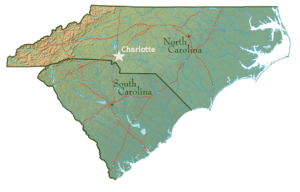 Centrally located in Charlotte, we have the advantage to reach all of the Metropolitan and surrounding areas. Click here to view our territory. Our Customer Service Representatives and trained technicians are professionals at managing the daily and continuing facets of all the products and services you receive from Atlantic Forklift. Don’t forget about preventative maintenance! There are a couple of options when it comes to making sure your equipment is serviced on a regular basis. Contact us for more information on our Preventative Maintenance programs and one of our experts will assist you in making the right choice for your machines. Chances are, if you are keeping up with your equipment, it will keep up with you!